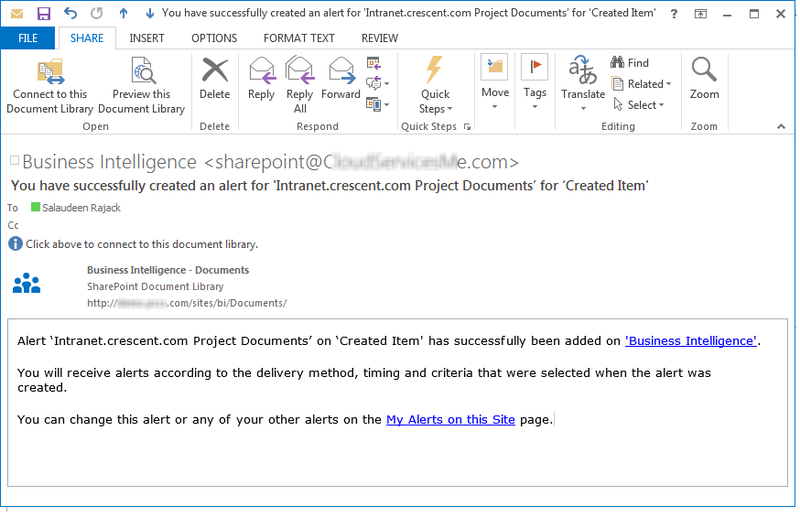 Requirement: Copy Alerts from one SharePoint list to another list. Solution: Use this PowerShell script to copy alerts between SharePoint lists or libraries. My scenario is: We've a list with number of alerts created for various users. We copied that list to a new site through "Save list as template" and the requirement of copying alerts came! write-host Found $SourceAlertsColl.count alerts in the source List! Wonderful! Million thanks Salaudeen!! I tested your script yesterday and it works perfect! I know you already mentioned about the message users will be getting once the new alerts are created. is there anyway to stop that? I thought I could just remove Outgoing SMTP server or set "alerts-enabled to false" and not have those messages sent but realized that won't even copy the alerts over. Appreciate any feedback you may have on this! Again this script is very helpful! Just tested your script for disabling alerts for a specific list. This won't help with the newly created alerts, right? Seems like it only disabled existing alerts. Thanks for any feedback Salaudeen!